Kuo says reiterates several claims that Apple will debut an “iPhone 5S” and a low-cost, plastic iPhone later this year. Corroborating a recent report from Digitimes, Kuo says that the iPhone 5S, much like the iPhone 5, will be in relatively short supply at launch. Digitimes pointed to the rumored fingerprint sensor as the likely culprit. Kuo only says the supply issues will be due to production difficulty with new components. He also says that the iPhone 5S will launch at the end of September and that supply will improve by October-November. As for the new iPhone with a plastic body, Kuo says that this device will arrive in early September because it is easier to produce than the iPhone 5S. The new iPhone model reportedly has unspecified “novel” new features. It is said to cost between $450 and $550 sans a contract. Kuo also says that production of the cheaper iPhone will likely cap at 26 million units this year, which he says is below previous expectations of a 2013 production ramp of 30-40 million pieces. Also coming in early September, Kuo says, is a redesigned full-sized iPad. As we previously reported, and provided photos of, a fifth-generation iPad with a thinner and lighter design is expected. 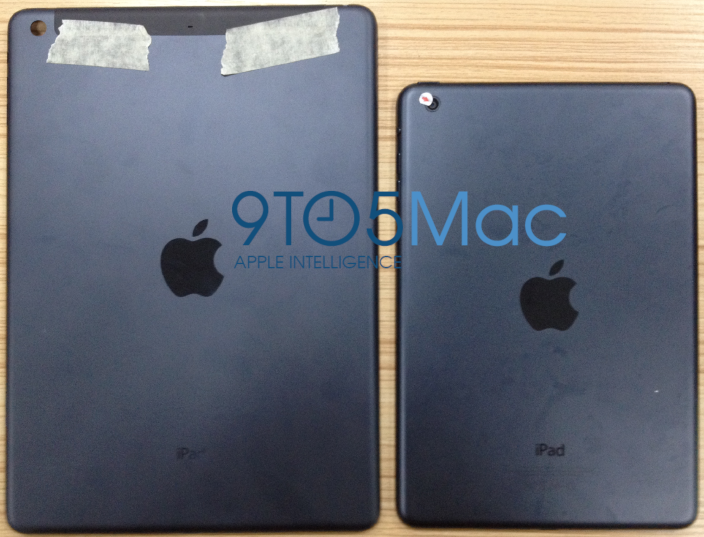 Our photos show that this new device will mirror many of the new design elements found in the iPad mini. As for a new iPad mini, Kuo claims that Apple will not update its 7.9-inch tablet this calendar year. However, Kuo discusses two new iPad minis being in the pipeline: a Retina Display model and a cheaper iPad mini with the A5 chip (found in the current iPad mini). Kuo does not see this new A5 model launching until next year because production is said to not begin until December. He also does not think it will be much cheaper to build than the current model. As for the Retina model, that device will reportedly include an A7 chip, a flurry of redesigned internal components, and a March/April 2014 debut. Unsurprisingly, following the launch of Intel Haswell based MacBook Airs, Kuo expects Haswell-focused updates to both Apple’s MacBook Pro and iMac this year. The new iMac is said to launch at the end of August, and the new Retina MacBook Pros are claimed to launch in mid-September.